I was at a little get together at a friend's place this past Friday night and she served these awesome fall festive concoctions. A cocktail like this is just so perfect for the upcoming holidays! The original recipe calls for vanilla vodka, which she chose to substitute with Pinnacle whipped cream flavored vodka. 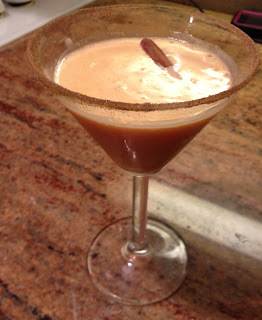 I suggest serving it as an indulgent after dinner cocktail treat for your upcoming Halloween party or substitue the cinnamon sugar rim with a crushed graham cracker crust rim for a new twist on pumpkin pie for Thanksgiving Day! Chill martini glasses by filling them with ice and a little bit of water. Let stand for 3 minutes. In a bowl combine the cinnamon and sugar and mix together. Take a small plate (wide enough to fit the rim of your martini glass), cover with granulated sugar and cinnamon. Empty ice and water out of martini glass. Dip the rim in the sugar and cinnamon covering the rim entirely. In a shaker filled with ice, combine pumpkin spice liquor, Pinnacle whipped cream flavored vodka and ice cream. Shake thoroughly. Pour martini mixture into the martini glass avoiding the rim and garnish with the cinnamon stick.